Transporter 2 director Louis Leterrier got the job to bring back the green ball of rage, after the mixed reception of the first big screen Hulk rendition in 2003 (starring Eric Bana and directed by Ang Lee). Zak Penn is one of the leading superhero screenwriters, having tackled subjects like X-Men, Elektra, and the Fantastic 4. Here he successfully continues the tortured existence of Stan Lee’s comic book scientist Bruce Banner, who was exposed to an experiment altering his physique to explode into a gigantic green man-monster when subjected to anger. Banner has retreated to Brazil into an anonymous, quiet existence, trying his utmost to avoid being subjected to anger while secretively working on an antidote with an anonymous on-line collaborator. But the military tracks him down and all hell breaks loose. In the process they transform another (already rather psychotic) soldier into an even more vicious creature than the Hulk. Sure there are many comic book style clichés like the love interest in peril and military nasties with their own destructive agenda, but that’s after all what it is. Norton is a surprising but effective choice as Dr. Banner. It has become customary to use finely tuned thespians to portray superheroes (from the aforementioned Bana and Christian Bale, to Robert Downey, Jr.), so it is no different here. 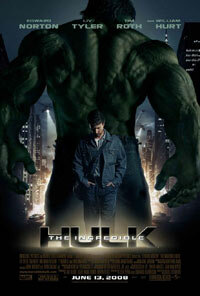 Loaded with intense action and top of the range special-FX, The Incredible Hulk is quite a ride. Extras: feature length commentary track with director Louis Leterrier and actor Tim Roth.